MakerBeam.eu also sells OpenBeam. OpenBeam is somewhat bigger than MakerBeam and measures 15x15mm. Here is the blog post where we introduce OpenBeam. You can also visit our webshop or see where in Europe you can buy OpenBeam. 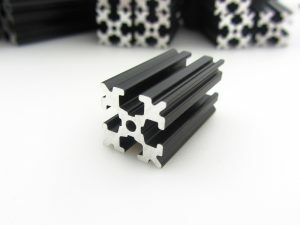 OpenBeam is a scaled down, desktop sized version of extruded aluminum framing systems commonly used in industry for rapidly prototyping and building machinery. We optimized for cost by using standard hardware instead of proprietary. Each of the 4 slots are designed to capture a regular DIN934 M3 nut. Brackets can then be attached to these nuts. With a quick turn of a 2mm hex key, the brackets can be repositioned anywhere along the beam. Adjusting and tuning an OpenBeam frame is therefore very easy. The hole that runs down the extrusion is not threaded but sized for an M3 sized tap. You can easily make threaded ends yourself. This allows button head screws to be used for blind mounting of OpenBeam components at 90 degrees to each other, as well as the use of feet to cap the ends of the extrusion. Since early 2017 ZT Automations, of which Mike Ziomkowski and Terence Tam (founder of OpenBeam) share 50-50% ownership, has taken over the OpenBeam name and day to day operations.